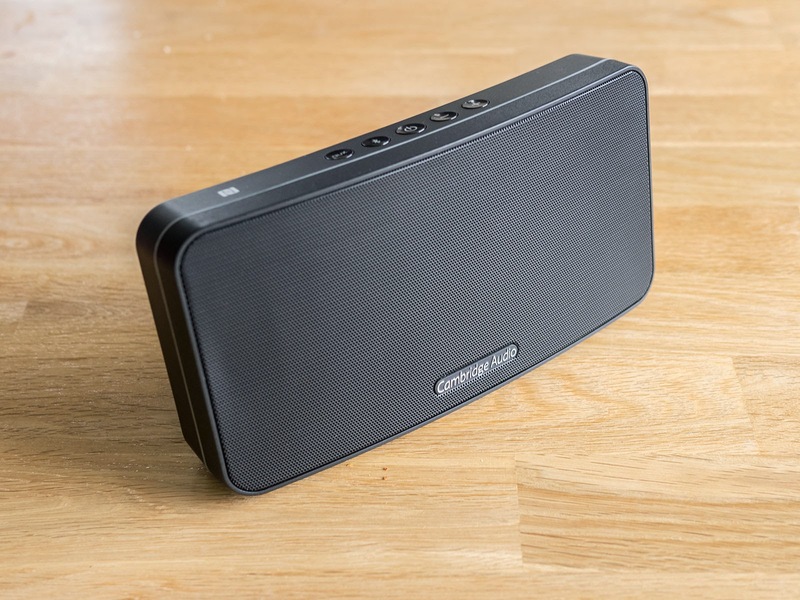 Oluv's Gadgets: Review: Cambridge Audio Go V2 - "return to sender"
Review: Cambridge Audio Go V2 - "return to sender"
Some Blogreaders and viewers of my YouTube channel were repeatedly asking me how the Cambridge Audio speakers compared to the current line of portable Bluetooth speakers and begged if I could make a comparison. I only knew the old Cambridge Audio Minx Go which I heard once in a store and was pretty disappointed by its performance. 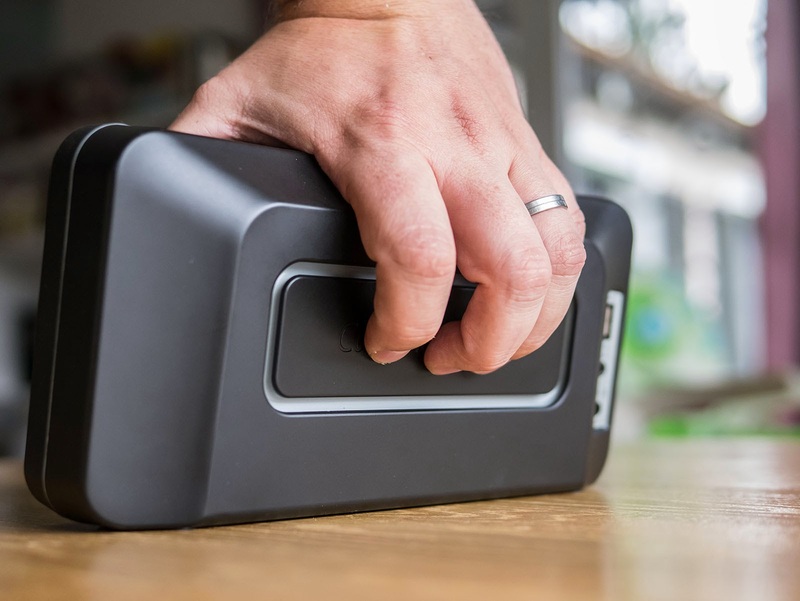 Meanwhile there is a new improved version out called "Go V2", so I thought I should give it another try to see how this speaker fits in the whole portable speaker market and if it is really worth its asked price. Let's have a look! 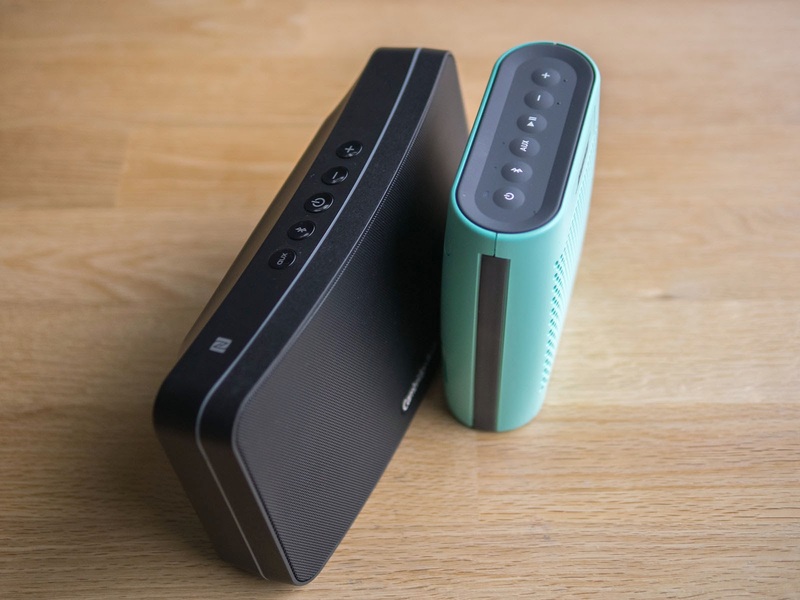 Some will have already noticed that my reviews tend to be a bit longer if the product deserves it and catches my full attention, while other reviews might become a bit short like in this case. When I unpacked the "Go" (how I will call it from now on) I would have willingly pack it in and sent it back again after hearing the first notes coming out of it. But the first thing I noticed when I took the speaker out of the packaging was a dent at the left side of the speaker grille. The speaker was definitely brand new but examining it closer the dent was certainly there and not just optical illusion. Then I thought maybe I squeezed it a bit too much when I took it out and tried to apply some pressure on the speaker grille which yielded immediately and felt like a thin cheap sheet. The speaker doesn't feel cheap on its own, but you never get the impression of a real high quality product. Turn it on and it will play a cheap "beep", one of that kind you also get from all the Chinese 20$ Bluetooth speakers. After pairing is done, it will play the same beep again. It also seems as if the beep was played back with the current volume level. So if you leave the speaker on its maximum volume and turn it on the next time it should play the beep with full blast! The volume control is not mirrored between speaker and streaming device, and the Go has only 15 dedicated volume steps, but you can of course further fine tune loudness through your player. The Go is not huge, but it is not a small speaker either. 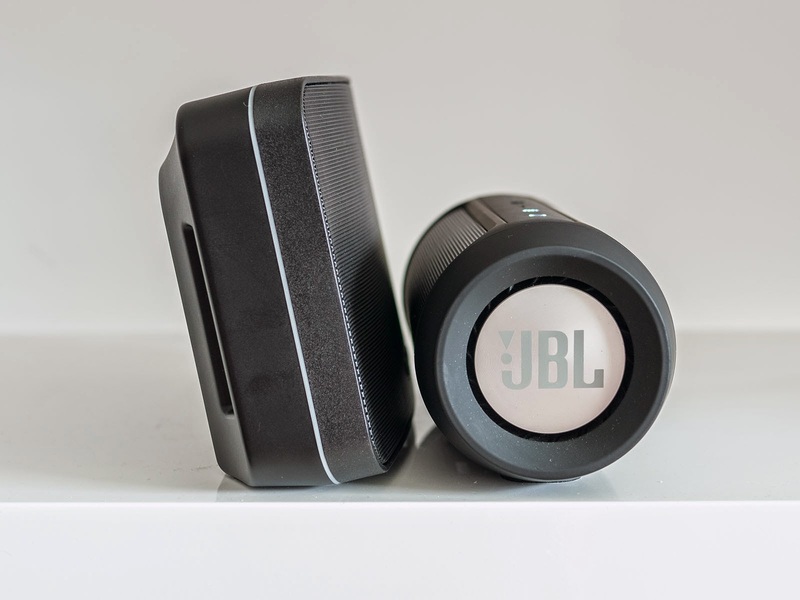 I would estimate around 1l cubature, compared to the JBL Charge 2, which I chose as reference the Go is both heavier and larger and more cumbersome to carry around. It is nearly impossible to securely grab the speaker without touching the passive radiator at the back, as this is the natural space where your fingers would usually go. If you want to carry the speaker while it is playing you will unavoidably touch the passive radiator which will rattle against your fingers. As the passive radiator is just at the back it makes the whole speaker a bit out of balance especially at higher levels. You won't hear it distort but it will vibrate quite much against the base and can make nearby objects rattle around. Compared to the Bose Soundlink Colour which can be currently had for 115€ versus the 149€ for the Go, the Bose is much easier to carry around. It is lighter, smaller and more comfortable to grab. The only nice feature the Go has is the ability to charge external devices. The built in battery seems to be quite strong and charging even works with the speaker turned off. Unfortunately the Go itself must be recharged with the dedicated power unit, you cannot charge it through USB like you can meanwhile with many other similar speakers even if only meant as compromise it is definitely helpful being able to recharge the speaker with any available USB-charger if you are on the way and forgot to take the charger with you. Compared to the old Minx Go version, the new one is missing the tiltable stand, but it gained some additional buttons, while the old one had only 3. Despite the new Bluetooth-button and Aux-button the fact cannot be hidden that there is still no track control available through the speaker nor does it have a built in speaker phone. The Go can just act as a speaker for playing music, therefore let's have a direct jump to discuss its main qualities. Let me state that the Cambridge Audio Go just sounds bad. I have no idea how it could gain such high praise from WhatHifi, claiming it to be the best sounding speaker in its class, because in reality the performance you get is rather that of an average kitchen radio. None of the "room filling sound" slogans printed on the box seems true as the sound is quite mid-focused but muddy at the same time. It might fill some small toilet maybe, but definitely nothing else. Despite its own built in tweeters the Go sounds somehow veiled and the sound has some coloration as if you were listening to some badly encoded internet radio station. There is some stronger upper bass emphasis, but bass already rolls off below 120Hz. It can become quite punchy at higher levels, but with really strong drum attacks the speaker will start to struggle and you will notice how the internal limiter algorithm is trying to prevent any distortion by keeping the volume down on stronger peaks which might result in some noticable volume fluctuations with particular tracks. The maximum volume of the Go is rather on the lower side. It is slightly louder than the maximum volume of the Fugoo in "loud mode", but considerably lower than that of the JBL Charge 2. 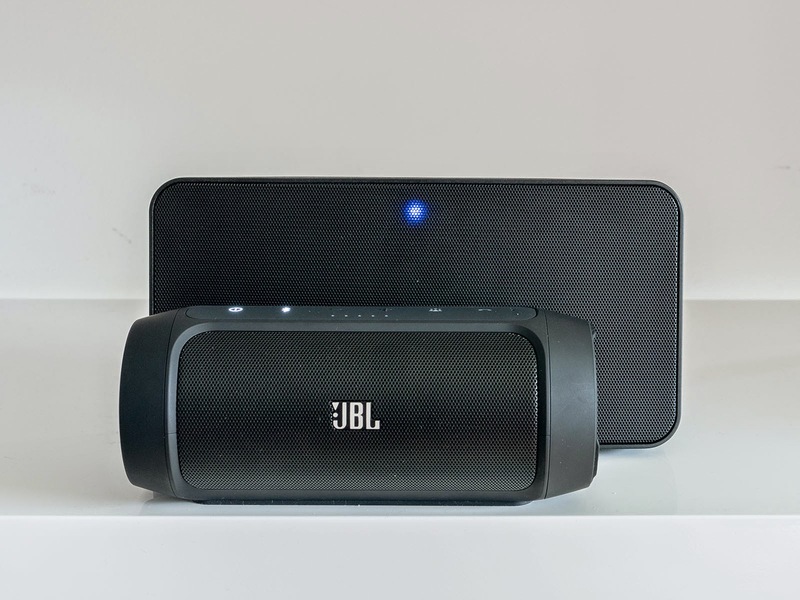 The Go doesn't apply any dynamic compression at higher levels and bass isn't reduced either, but the JBL Charge 2 despite some bass reduction will nevertheless sound more powerful exceeding the Go in maximum loudness. At low levels the Go sounds hardly better than a Mini Jambox. 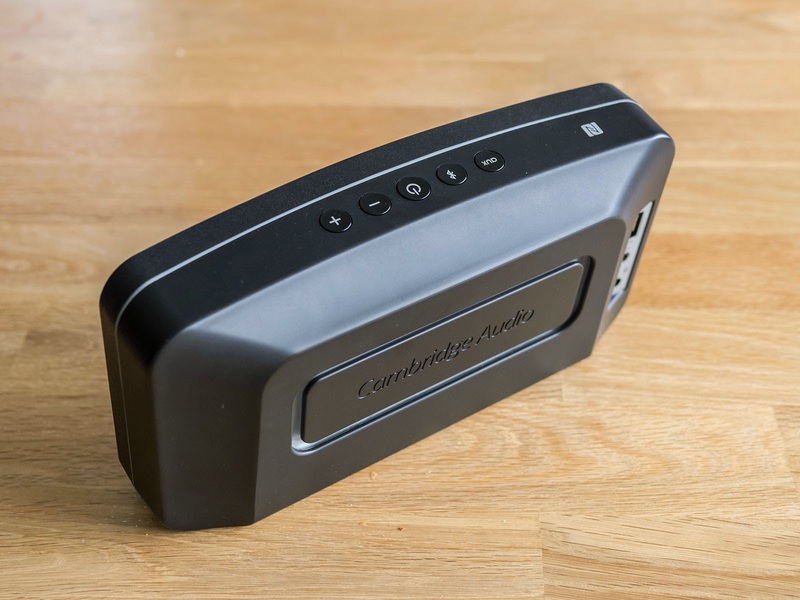 A Fugoo which is much smaller manages to sound more open, more profound with considerably better and deeper bass response and an overall more pleasant sound up to its medium volume. Up from there the stronger upper bass from the Go takes over and will drown the small Fugoo, but on many tracks I still preferred the tuning of the Fugoo which was not as bass-heavy but still with enough deeper bass thump and a fresher overall sound than the Go. 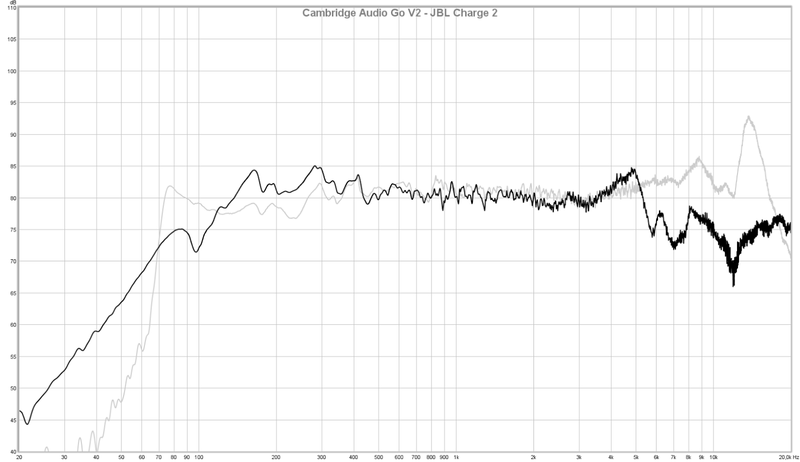 The Cambridge Audio Go even manages to sound worse than the B&W T7, which is a merit! My wife who by no means is an audio junkie even asked why is the sound that bad, when I was testing the Go playing some tunes through it. 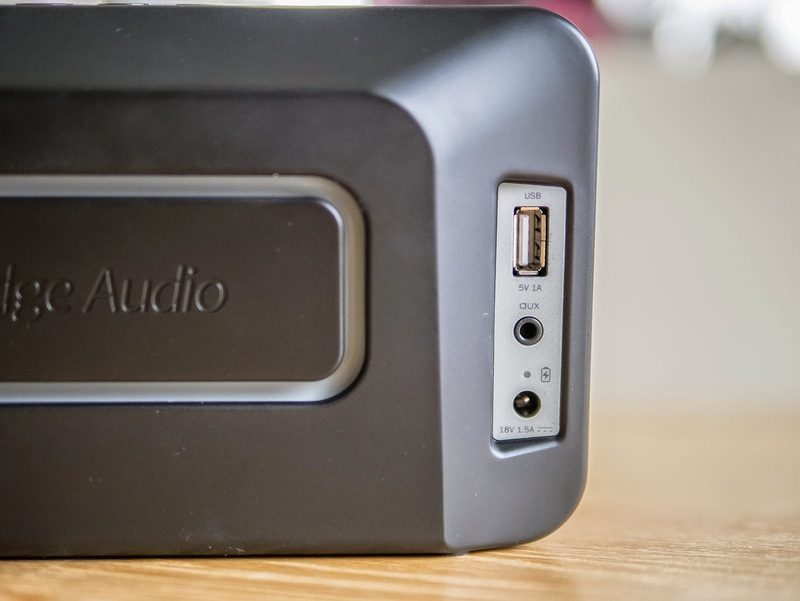 The Cambridge Audio Go V2 is not totally hopeless, I have definitely heard worse sounding speakers than that, but I have also heard much better ones which were either cheaper or smaller at the same time. I just don't understand the many raving reviews it managed to gather. 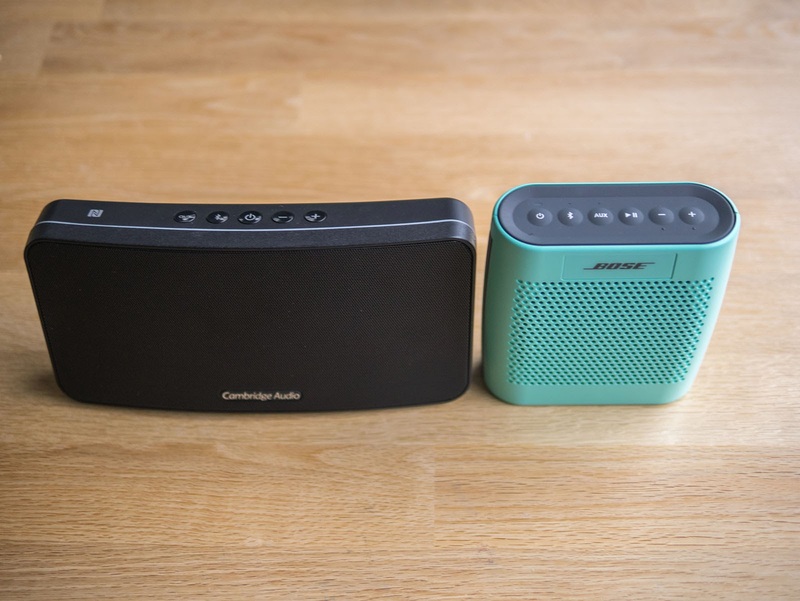 If you are in the market for a portable Bluetooth speaker, I would definitely avoid the Cambridge Audio Go V2, as it doesn't do anything really satisfactorily. 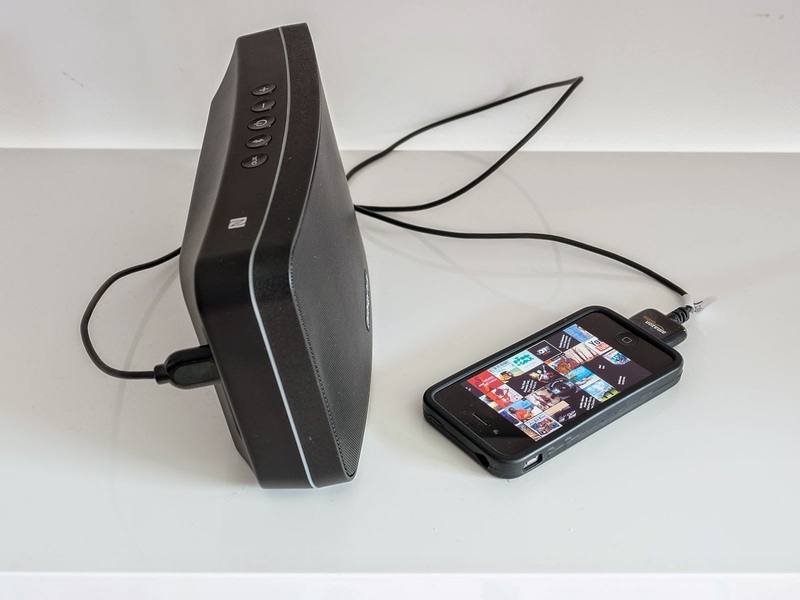 It can charge external devices for sure, but if you want to listen to music there are much better options out there. If you like it loud, the Go V2 fails completely as it doesn't even reach the loudness of much smaller speakers like the Bose Soundlink Mini. I am not quite sure who might be the right customer for it, but anyone a bit more serious about music won't be satisfied with it. Thanks for this review so much. 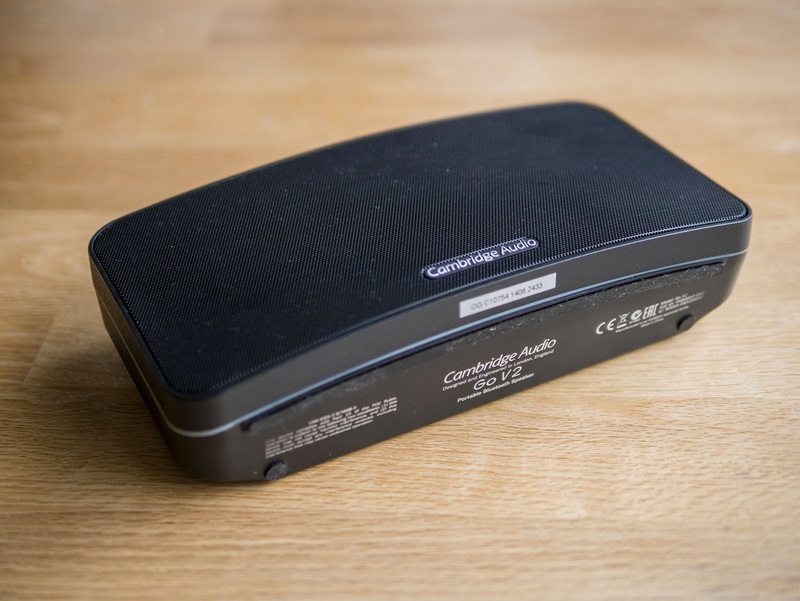 I was thinking to buy the Cambridge audio go radio, but after this review I will think again. 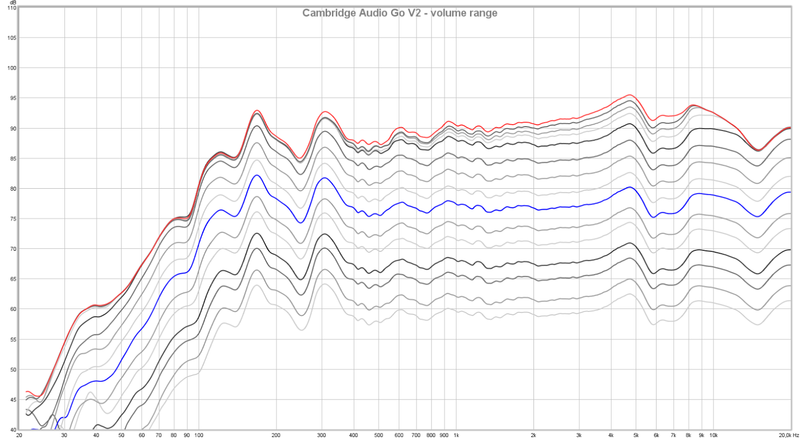 I assume the new Cambridge audio G2 will have similar sound although good build quality. Did you have any chance listen to the new G2? Great job with your reviews. I check your blog every week to see if you updated any new review. I can not wait to read another one. thanks for your comment, yes I have already done some recordings with the G2. it is not really bad, but it has some very harsh treble-emphasis at 10khz which makes it quite sizzling. it doesn't come close to either bose soundlink mini or jbl charge 2, although it looks like a direct bose rip-off, but larger. i am not sure when i will be able to finish a full review, but i will post some comparison videos soon. I have already purchased the Denon Envaya mini from Comtech. They had the best price on the market 79,90e and shipping to Slovakia was 17,99e. It is still good because I was willing to pay 109 for it from some Polish webpage. Here the Denon distributor offered me the classic Envaya in sale price 159,20e. They did not respond to my question about Envaya mini at all. So I ordered online from Germany and it should be here on the 7th. 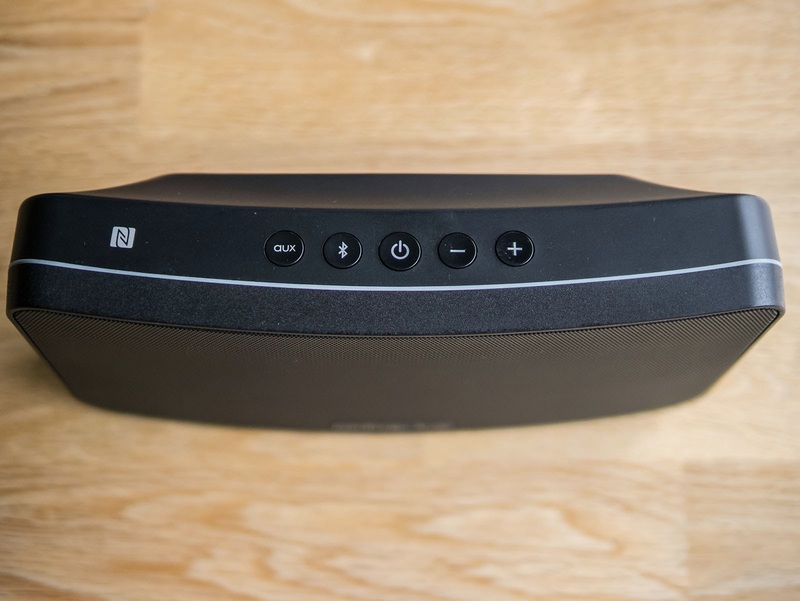 Can you recommend bluetooth speaker better than this one? I listen to music only in the little room and I don't care about design and easily portable. JBL Charge 2, but you must be sure to get a fixed one. It seems the new batches have most problems corrected now, although nobody can tell you if you will get a new or old one. Even the small Denon Envaya Mini (99€) sounds better than this Cambridge Audio crap! ah... however if I don't need portable, just need more louder and more sound quality, what do you recommended? I'm watching under 300 EURO. Thanks for your nice recommend. I know all of that product! At first I thinks buy ruark but i don't need 2 or 2.1 speaker cuz I have already. then stanmore or onyx, KMC can used to TV speakers by aux? It will be used by my parents to listen music or watching tv. yes the klipsch has aux, the onyx studio not only bluetooth. you can use the google translate feature on the right bar at the top of the site, maybe that helps. where are you from? Hi. First of all thank you for sharing your knowledge and congratulations for this fantastic site. I'm looking for a good bluetooth speaker, with battery. AND WITH FM RADIO. Here is the problem. I have found only the Cambridge Go Radio, and the Teufel Boomster. And I liked the Cambridge because the Teufel is a little oversized for me. But after this review, the Cambridge has been rejected. I don't find other products that promise what Cambridge did, devices under 2.5 kg and with good quality. I have found little speakers under 50€ but I'm afraid they won't be very different to a kitchen clock radio. Do you know any other suitable device? you are right, most of the cheap solutions will rather sound like clock radios. there are not many bluetooth speakers with fm radio included, you could have a look at the bayan audio soundbooks, there are bigger and smaller models, not sure how they sound, i was promised to get sample units, but i never got any. another option could be the geneva world radio, i haven't heard it either, but it looks pretty serious. Geneva Sound World has all that you want plus dab radio tell us your opinion admin because i have the same dilema with jaime! Thank you very much for your help. I will continue my research and promise to tell you the results. Hello! I was looking to purchase this speaker after reading many reviews and also reading 'what hi-fi' but was also looking at the fugoo. After reading your review I am unsure.. I listen a lot of dance music, mostly techno. Would you recommend the fugoo over the 'go' or a different speaker? Thanks! Hello. Now that whathifi reviewed the Envaya Mini it is unbelievable that they evaluated it 4 stars against the Cambridge Audio Go which was evaluated 5 stars. I am thinking if whathifi is still a valid review site or I should look elsewhere for hifi reviews. I have a minx go V1 and the sound is very good. I use it in my living room and most people think it is my large 20 inch speakers that are playing. The go is excellent with voice and classical. But I agree that the low frequency response is not so good. Maybe the V2 is not as good ? From what I heard the V1 was even worse, really nothing outstanding with this speaker, a TDK A33 eats it for breakfast, while not being that impressive either. Not sure what the people like about the Cambridge Audio stuff. I too have the Minx Go v1 and I love it. Sounds very good to me for the size of speaker. I`ve been through my fair share of speakers, usually going with brands like B&W and Mission. This Minx Go sounds perfectly good for it size. 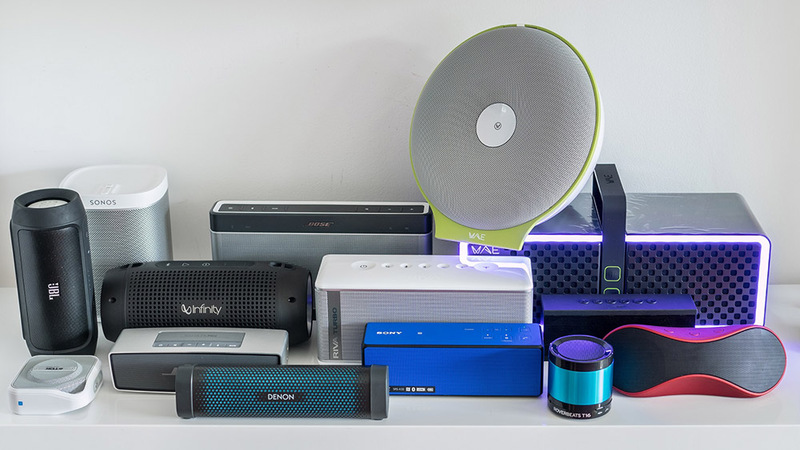 hi can you recommend Bluetooth speaker with fm radio which is the best? The surround sound system that ties into your consumer electronics that you have, or may need to have installed, you need a world class expert to show you the proven strategies that will eliminate the headaches and heart aches most homeowners go through.